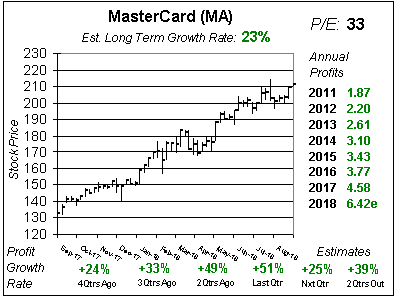 MasterCard (MA) is on a roll as it has beaten the street and had annual profit estimates climb the past three qtrs. During the last three qtrs 2016 profit estimates have climbed from $3.54 to $3.63 and now $3.75. 2017’s estimate has risen from $4.14 to $4.20 and $4.29. These little differences make a big difference over the course of the year, and these bump-ups also signal a healthy business. The company has been experiencing double-digit volume and transaction growth for a while now, but foreign exchange was reducing profits to the point MA will likely grown profits 10% a year the past two years, way less than the decade average of 27% a year. Also, MA gives up-front incentives to banks to garner new business and this hurts profits in the beginning of the deal while helping profits further out. Now MA isn’t a rapid grower like it was years ago, but the Est. LTG is 15% a year and it would be nice if profit growth got back to that level. Qtrly profit Estimates are are for profit growth of 9%, 15%, 14% and 11% the next 4 qtrs — so if MA continues to beat the street perhaps the company can deliver 15% profit growth in 2017. Management also buys back stock, which could give these numbers a boost.MasterCard is a safe stock that pays a yield of just under 1%. This core stock is beloved by mutual fund managers who like long-term growth with large safe companies. Profits have grown every year since the stock went public. I am adding MA to the Conservative Portfolio today and have it on the radar for the Growth Portfolio if it gets down below $100. Last qtr MA posted revenue growth of 14% and profit growth of 19%, which blew away estimates of 7% profit growth. In comments to investors, management said the US is on a steady growth path and many markets across Europe are showing gradual recovery. The UK remains stable. In China exports & imports were down sharply. Brazil seems to be bottoming out, things are getting worse in Venezuela, and in Mexico the economy continues to expand. 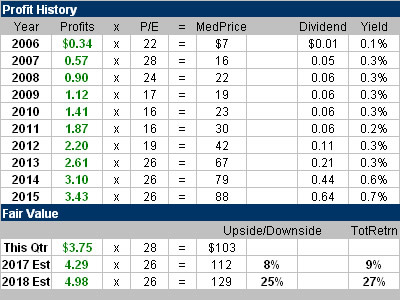 MA’s P/E was 28 last qtr and this qtr it’s 24. The stock is cheaper now, because I’m calculating the P/E based on 2017 profits instead of 2016’s. 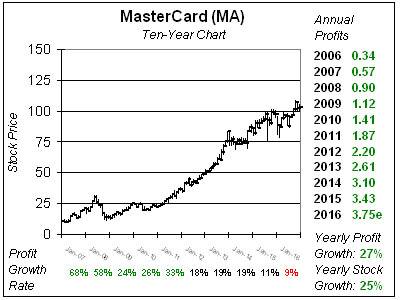 MasterCard has been selling for 26x earnings for a while now. That’s surprising because the profit growth rate slowed from the 20s to the high-teens in 2012 and then to around 10% these past two years. I think investors appreciate the steady growth MA provides. My 2017 Fair Value is $112 and 2018’s is $129. There’s good upside to 2018’s figure. Keep in mind estimates have also been on the rise, thus my Fair Values could increase accordingly. 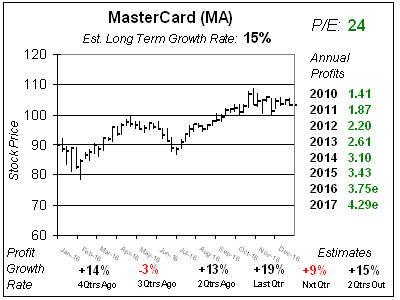 MasterCard is a solid buy-and-hold stock that provides a good solid base for stock portfolios. 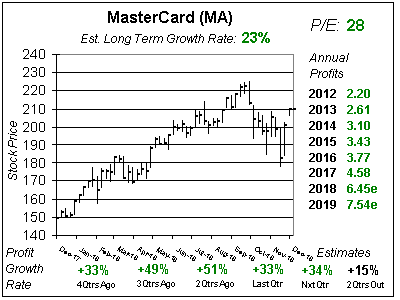 MA is a conservative stock that is expected to grow profits at 15% a year, has grown profits each and every year since going public, pays a dividend, and buys back stock. Recently, profits have been hampered by a strong USD and incentives paid our for new business, but the outlook is better for 2017. I will add MA to the Conservative Growth Portfolio where it will rank 16th of 30 stocks in the Power Rankings.